A good storm passed during the second inning of a Lincoln Saltdogs game the other night. 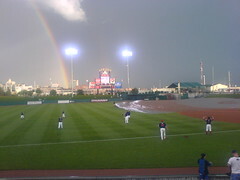 As the storm moved out, the tarp was removed and the players warmed up, a full double rainbow broke out over Lincoln. A hot humid day quickly gave way to an evening where sweatshirts were comfortable.